FILE - The U.S. Capitol Building is seen Nov. 19, 2011. The U.S. Congressional Budget Office says 14 million people will lose their health insurance coverage next year if Congress approves the Republican plan to replace the Affordable Care Act, commonly known as Obamacare. The CBO, a group of nonpartisan budget analysts and economists, released its report Monday on the cost of carrying out President Donald Trump's campaign pledge to overhaul the system put in place by his predecessor, Barack Obama.Trump and other Republicans say the current system is too expensive and unfairly forces people to buy health insurance. The CBO report says if the Republican plan is adopted, the number of uninsured people would rise by 14 million, to a total of 41 million, in 2018.By 2026, that number would reach 52 million, compared to 28 million if Obamacare were to remain in place. The health care law adopted in 2010 was a signature program for Obama, and brought coverage to 20 million people who previously lacked insurance. The CBO said the new Republican plan would cut the federal deficit by $337 billion through 2026.By comparison, the CBO estimates that in 2017, the federal government will have $4 trillion in spending that adds $559 billion to the deficit. Health and Human Services Secretary Tom Price criticized the report, telling reporters outside the White House that the CBO only looked at part of the new Republican health care plan. He said it is "impossible" for the plan to leave 14 million people with no health coverage, because premiums will actually go down and people can pick their own insurance, instead of a plan that suits the government. Price also said the CBO did not take into consideration all of the pieces that would be part of the plan, including pending legislation to reform the insurance market. 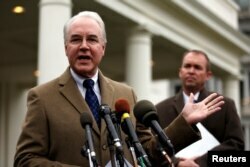 U.S. Secretary of Health and Human Services (HHS) Tom Price, left, and Office of Management and Budget (OMB) Director Mick Mulvaney speak to reporters after the Congressional Budget Office released its score on proposed Republican health care legislation at the White House in Washington, March 13, 2017. The CBO's report says premiums are expected to rise in the first few years before decreasing starting in 2020.It says provisions in the Republican law would allow insurers to charge older people five times as much as younger people, as opposed to three times as much under the current law. The new plan would eliminate the so-called individual mandate, which requires most people to carry health insurance or pay a tax penalty. "Most of the reductions in coverage in 2018 and 2019 would stem from repealing the penalties associated with the individual mandate," the CBO said. "Some of those people would choose not to have insurance because they choose to be covered by insurance under current law only to avoid paying the penalties. And some people would forgo insurance in response to higher premiums." House Democratic Leader Nancy Pelosi urged Republicans to withdraw the health care bill, saying it is "the only decent thing to do." The leader of Senate Democrats, Chuck Schumer, said, "Trumpcare would be a nightmare for the American people." He added that it benefits the rich while giving everyone else "the cold shoulder." 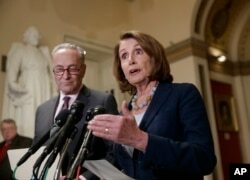 House Democratic Leader Nancy Pelosi of California, and Senate Democratic Leader Chuck Schumer of New York speak to reporters about the Congressional Budget Office projection that 14 million people would lose health coverage under the House Republican bill dismantling former President Barack Obama's health care law, on Capitol Hill in Washington, March, 13, 2017. But Trump calls Obamacare a "disaster," and says it is collapsing because of rising premiums, the cost to small businesses, and lack of choice for consumers. Obamacare also became infamous for its difficult introduction in 2013 that included computer failures and a confusing bureaucracy. Trump has promised that his health plan will "cover everybody" and offer cheaper policies for individuals and small groups of people who buy insurance for themselves rather than getting coverage through their jobs. Republican lawmakers want to retain two of the most popular features of Obamacare -- banning insurers from dropping coverage for anyone because of a pre-existing medical condition, and allowing young people to stay on their parents' policies until they turn 26 years of age. Republican lawmakers want to retain two of the most popular features of Obamacare — banning insurers from dropping coverage for anyone because of a pre-existing medical condition, and allowing young people to stay on their parents' policies until they turn 26.